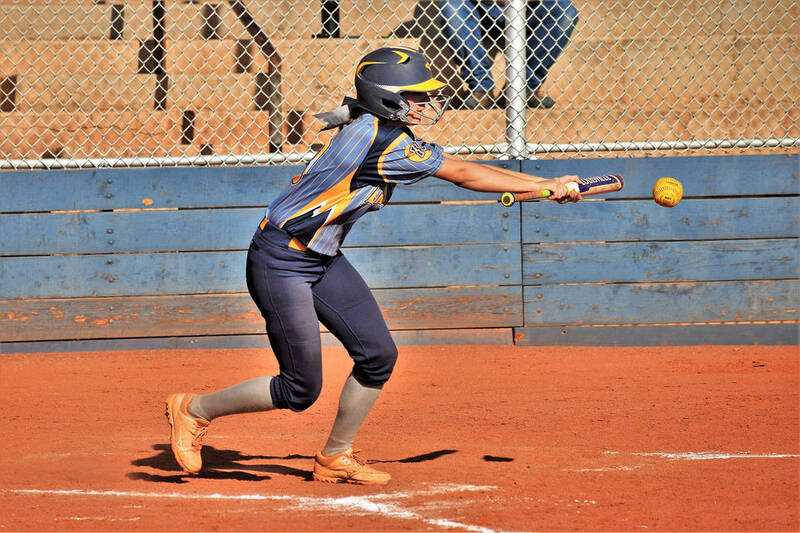 Coming through in the clutch, Boulder City High School softball team knocked off 3A Sunrise League champion Moapa Valley 8-3 on April 27, proving its season is far from over. Robert Vendettoli/Boulder City Review Jordan Moorhead , a senior at Boulder City High School, slaps a bunt against Southeast Career Technical Academy on April 25 in the Lady Eagles' 22-5 victory. Suffering a minor setback earlier in the week when they fell to Virgin Valley 13-11 on April 23 without senior star Bailey Bennett-Jordan, the Lady Eagles were focused and ready to play against their rival Pirates in a must-win game with their workhorse back on the mound. Stepping up to the challenge herself, Bennett-Jordan was on against the Pirates, striking out nine batters. Throwing seven innings, Bennett-Jordan allowed three runs off of six hits, while her offense did a nice job of backing her up with 12 hits of their own. Sophomore Ellie Ramsey finished 1-for-4 with two RBIs, while senior Jerra Hinson finished 3-for-4 with an RBI double. Helping her own cause, Bennett-Jordan finished 1-for-4 with two RBIs, while senior Jordan Moorhead finished 2-for-4 at the plate. Continuing their dominance on the mound and at the plate, the Lady Eagles defeated Chaparral 8-0 behind 11 hits offensively and 16 strikeouts from Bennett-Jordan. Overpowering the Cowboys, Bennett-Jordan picked up the win after allowing only three hits, while senior Lily Osman hit a two-run home run in the bottom of the third inning. Also finishing with two RBIs, junior Marleena Mills batted 2-for-4 at the plate, while junior Ryann Reese finished 3-for-4. Defeating Southeast Career Technical Academy 22-5 on April 25, Reese finished 2-for-2 with three RBIs, while sophomore Ashley Wishard provided her best effort of the season, finishing 2-for-2 with five RBIs and a double and triple each. Hitting the cover off the ball against the Roadrunners, senior Summer Coyle finished 1-for-1 with three RBIs, while Jordan Moorhead finished 1-for-3 with two RBIs. Results from Wednesday’s senior night game against Del Sol will appear in next week’s issue.